Sirodesmin PL is a secondary metabolite toxin made by the ascomycetous plant pathogen, Leptosphaeria maculans. The sirodesmin biosynthetic genes are clustered in the genome. The key genes are a non-ribosomal peptide synthetase, sirP, and a pathway-specific transcription factor, sirZ. Little is known about regulation of sirodesmin production. Genes involved in regulation of sirodesmin PL in L. maculans have been identified. Two hundred random insertional T-DNA mutants were screened with an antibacterial assay for ones producing low levels of sirodesmin PL. Three such mutants were isolated and each transcribed sirZ at very low levels. One of the affected genes had high sequence similarity to Aspergillus fumigatus cpcA, which regulates the cross-pathway control system in response to amino acid availability. This gene was silenced in L. maculans and the resultant mutant characterised. When amino acid starvation was artificially-induced by addition of 3-aminotriazole for 5 h, transcript levels of sirP and sirZ did not change in the wild type. In contrast, levels of sirP and sirZ transcripts increased in the silenced cpcA mutant. After prolonged amino acid starvation the silenced cpcA mutant produced much higher amounts of sirodesmin PL than the wild type. Production of sirodesmin PL in L. maculans is regulated by the cross pathway control gene, cpcA, either directly or indirectly via the pathway-specific transcription factor, sirZ. Sirodesmin PL is the major phytotoxin produced by the plant pathogen Leptosphaeria maculans (Desm. ), the causal agent of blackleg disease of Brassica napus (canola). Sirodesmin PL has antibacterial and antiviral properties  and is essential for full virulence of L. maculans on stems of B. napus . This toxin is an epipolythiodioxopiperazine (ETP), a class of secondary metabolites characterised by the presence of a highly reactive disulphide-bridged dioxopiperazine ring synthesised from two amino acids (for review see ). The first committed step in the sirodesmin biosynthetic pathway is prenylation of tyrosine [4, 5]. As for other fungal secondary metabolites, the genes for the biosynthesis of sirodesmin PL are clustered. The sirodesmin cluster contains 18 genes that are co-ordinately regulated with timing consistent with sirodesmin PL production. Disruption of one of these genes, sirP, which encodes a peptide synthetase, results in an isolate unable to produce sirodesmin PL . Based on comparative genomics, the cluster of genes in Aspergillus fumigatus responsible for the biosynthesis of another ETP, gliotoxin, was then predicted. The pattern of expression of the clustered homologs was consistent with gliotoxin production . The identity of this gene cluster was confirmed via the disruption of peptide synthetase, gliP whereby the resultant mutant was unable to make gliotoxin [8, 9]. These ETP gene clusters also encode a Zn(II)2Cys6 transcription factor, namely SirZ for sirodesmin, and GliZ for gliotoxin . Such factors are often found in biosynthetic gene clusters for secondary metabolites and they regulate transcription of the biosynthetic genes and consequently metabolite production. Disruption of A. fumigatus gliZ resulted in a mutant isolate unable to produce gliotoxin . RNAi-mediated silencing of sirZ in L. maculans revealed that sirZ is essential for the transcription of sirodesmin biosynthetic genes and consequently production of sirodesmin PL . In this paper we describe the identification of three genes that regulate sirodesmin PL and are unlinked to the sirodesmin gene cluster. One of these genes is denoted as cpcA (cross pathway control A), and is involved in regulation of amino acid biosynthesis in fungi such as Saccharomyces cerevisiae, Aspergillus nidulans, and A. fumigatus [12–14]. This pathway acts as a metabolic switch to enable the fungus to synthesize amino acids during periods of amino acid limitation. In this paper we describe the effect of starvation on the expression of sirodesmin biosynthetic genes and sirodesmin PL production in L. maculans wild type and cpcA-silenced isolates. To generate sirodesmin-deficient mutants of L. maculans, wild type isolate IBCN 18 was transformed with plasmid pGTII, which contains T-DNA with a selectable marker (hygromycin-resistance) thus generating random insertional mutants . Two hundred such mutants were then screened using a bioassay that exploits the antibacterial properties of sirodesmin PL . Six-day-old cultures of the mutants grown on 10% Campbell's V8 juice agar were overlaid with a suspension of Bacillus subtilis. The presence or absence of zones of clearing of the bacterial lawn around the fungal colony 16 h later reflected the presence or absence, respectively, of sirodesmin PL. Three mutants, as well as a previously characterized mutant in the peptide synthetase gene (ΔsirP) in the sirodesmin biosynthetic pathway , did not clear the B. subtilis lawn. Sirodesmin-deficiency of these mutants was confirmed by HPLC analysis of filtrate of six-day-old cultures grown on 10% Campbell's V8 juice, whereby a peak eluting at 18.2 min in the wild type and co-incident with that of sirodesmin PL, was absent from profiles of the three mutants (data not shown). Quantitative RT-PCR showed extremely low levels of transcripts of the sirodesmin pathway-specific transcription factor, sirZ, in the three T-DNA mutants compared to the wild type strain (Figure 1). In these mutants a single copy of T-DNA had inserted in either the 5' or 3' untranslated regions of predicted genes (Table 1). Quantitative Reverse Transcription PCR analysis of the sirodesmin pathway-specific transcription factor, sirZ . in Leptosphaeria maculans wild type (IBCN 18) and sirodesmin-deficient mutants GTA6, GTA7 and GTA9. Cultures were grown for six days in 10% V8 juice. Gene expression level is normalised to that of actin. Values are means ± SE of triplicate reactions of three independent biological samples. This experiment was repeated twice and consistent results were seen. These genes were named dsp (deficient in sirodesmin production) and one of them (dsp1 in mutant GTA6) was predicted to encode a hypothetical protein with a fungal-specific domain (DUF1752) of unknown function. The closest match was to a hypothetical protein from the dothideomycete, Pyrenophora teres f teres. The other two genes, dsp2 and dsp3 (in mutants GTA7 and GTA9, respectively), encoded putative transcription factors; dsp3 had a Zn(II)2Cys6 DNA- binding domain, whilst dsp2 had a leucine zipper region. This latter transcription factor had best matches to a hypothetical protein from P. teres f teres and cross-pathway control protein 1 in P. tritici-repentis and also a significant match to CpcA in Aspergillus fumigatus (38% identity, 50% similarity). While the two Pyrenophora proteins were reciprocal best hits, CpcA of L. maculans was the next best match. This single copy L. maculans gene was denoted as cpcA and characterised further as described below. Bioinformatic analysis revealed that L. maculans cpcA is intronless and encodes a predicted protein of 246 amino acids (Figure 2A). This finding was confirmed by PCR-amplification of either genomic DNA or cDNA with the wild type isolate as template. To characterize regions upstream of the cpcA transcript, 5' RACE was carried out. Similar to previously characterised cpcA homologs in Aspergillus sp. , two upstream open reading frames (uORFs) were identified at positions -541 bp (uORF1) and - 344 bp (uORF2), relative to the predicted first AUG of the cpcA-encoding region (Figure 2A). Upstream ORF1 was 12 bp, and encoded MAAI, whereas uORF2 was 159 bp and had high sequence similarity to uORF2 mapped in the 5' leader region of A. fumigatus cpcA and A. nidulans cpcA (Figure 2B). RACE analysis of the 3' untranslated region showed that the transcript from mutant GTA7 was truncated prematurely by the insertion of 36 bp from the left border of the T-DNA and lacked 127 bp of sequence upstream of the predicted polyadenylation site. The carboxy terminus of CpcA contained a region similar to the basic region of bZIP superfamily of transcription factors with strong sequence similarity to that of the homolog in A. fumigatus or A. nidulans (Figure 2C). In contrast with the Aspergillus homologs, the leucine zipper region contained three conserved leucine residues characteristic of a leucine zipper L-x(6)-L-x(6)-L-x(6)-L (Figure 2C). As expected for a protein with a transcription factor domain, CpcA was predicted by PSORT II to be localised in the nucleus (69.6% probability) and SignalP did not predict the presence of an N-terminal signal peptide (98.7% probability). In A. nidulans, cpcA transcription is autoregulated via cross pathway regulatory elements (CPRE) 5' TGA-(C/G)-TCA-3' in the cpcA promoter . Point mutations in CPRE lead to low levels of cpcA transcripts and CpcA protein, when amino acids are limited. Such an element matching the consensus was present on the minus strand in the promoter region of L. maculans cpcA (-698 to -703). A) The cpcA locus of Leptosphaeria maculans. The conserved leucine zipper region at the C-terminus of cpcA is dark grey. The open boxes indicate the upstream Open Reading Frames uORF1 and uORF2 in the 5' leader region. The black dot preceding them represents the putative cross-pathway control element (CPRE) whose sequence is 5'TGACTCA3'. B) Alignment of the deduced amino acid sequence of uORF2 with counterparts in the leader sequences of Aspergillus fumigatus (Af) cpcA (GenBank XP_751584.1) and A. nidulans (An) cpcA (GenBank AF302935). Black boxes with white text denote amino acids identical in two of the three fungal species. Grey boxes with white text mark conserved changes. Gaps are introduced to optimize alignment. C) Alignment of the deduced amino acid sequence of the C-terminus conserved leucine zipper region with that of A. fumigatus CpcA and A. nidulans CpcA. The thick black line denotes the bZIP transcription factors basic domain signature (PS00036). Asterisks mark positions where conserved leucine residues characteristic of a leucine zipper (L-x(6)-L-x(6)-L-x(6)-L) should be found. Although insertion of the T-DNA downstream of cpcA in mutant GTA7 reduced the transcript size by 127 bp, it did not reduce transcript levels of cpcA compared to those of the wild type (data not shown). Since the efficiency of gene disruption in L. maculans is very low, RNA mediated silencing was exploited to develop an isolate with extremely low levels of cpcA transcripts in order to study the effect of cpcA on sirodesmin PL production. Several putatively-silenced transformants were analysed and one, cpcA-sil, with 10% transcript level of that in wild type, as seen by q RT-PCR analysis, was chosen for further analysis (data not shown). The effect of silencing cpcA on transcript levels of amino acid biosynthetic genes, sirodesmin biosynthetic genes, as well as the production of sirodesmin PL was then examined. The wild type and silenced isolate were grown for eight days in Tinline medium , which contains 83 mM glucose and 2 mM asparagine as carbon and nitrogen sources. Since starvation for at least one amino acid is sufficient to induce cpcA expression in A. fumigatus , amino acid starvation was induced in cultures of L. maculans wild type and cpcA-sil isolates by addition of the 'false feedback' inhibitor, 3-aminotriazole (3AT), a histidine analog that inhibits the histidine biosynthetic enzyme, imidazole glycerol phosphate dehydratase . Five hours later, levels of transcripts of several genes relative to actin were measured by q RT-PCR. In the absence of 3AT, transcript levels of cpcA in the silenced isolate, cpcA-sil, were 7% of that of wild type. In the presence of 5 mM 3AT, transcript levels of cpcA increased significantly in the wild type (3 fold; p = 0.004) and in the silenced isolate (6 fold; p = 0.009) and yet the transcript levels of cpcA in the silenced isolate remained only 16% of that of wild type (Figure 3A). Next the ability of L. maculans CpcA to regulate amino acid biosynthesis was examined. In Aspergillus spp., transcript levels of tryptophan synthase, trpC, increase upon amino acid starvation, but remain low in isolates that are mutated in cpcA, whereas transcript levels of chorismate synthase, aroC, remain unchanged [14, 18]. After 8 days in Tinline media, there was no significant difference in transcript levels of trpC of wild type or silenced isolates of L. maculans (data not shown). As expected, transcript levels of trpC increased significantly in wild type L. maculans in the presence of 5 mM 3AT (4 fold; p = 0.0003); a smaller increase was seen in the cpcA-silenced isolate (2 fold; p = 0.01). No significant differences in transcript levels of aroC were observed, even during amino acid starvation (Figure 3A). The levels of transcripts of sirZ and sirP, which are involved in sirodesmin PL biosynthesis did not differ significantly (p = 0.9 and 0.5) in the wild type in the presence or absence of 5 mM 3AT. However, there was a significant increase in transcript levels of sirZ (p = 0.008) and sirP (p = 0.0005) in the cpcA-silenced isolate after 5 h of amino acid starvation (Figure 3B). 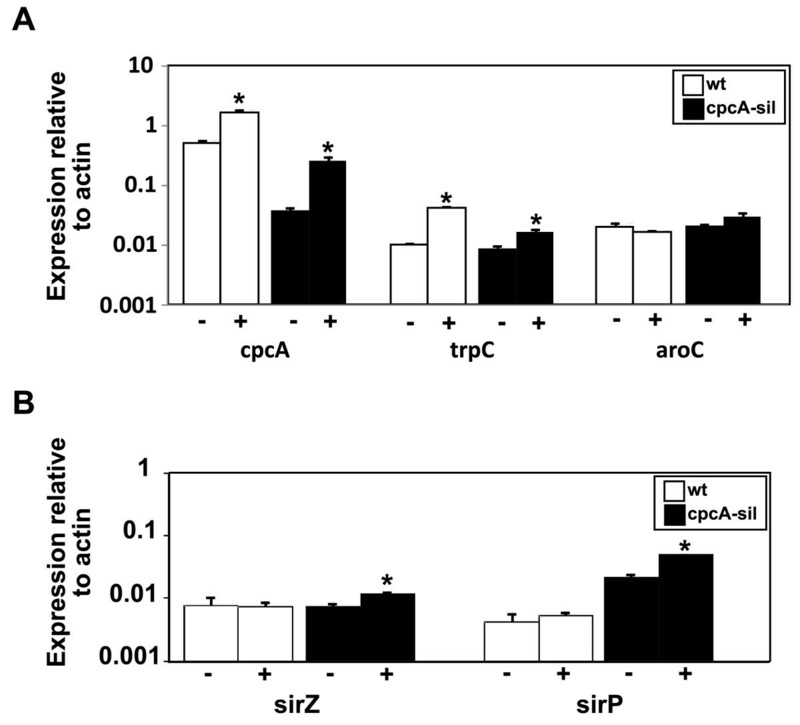 Quantitative Reverse Transcription PCR analysis of (A) cpcA, trpC and aroC , (B) sirZ and sirP in wild type (wt) and a cpcA -silenced (cpcA-sil) isolate of Leptosphaeria maculans. Six replicates of each isolate were grown in Tinline for eight days and then mycelia were washed and then transferred to fresh Tinline media for 5 h with 5 mM 3AT (+) or without 3AT (-). RNA was isolated from all treatments, cDNA prepared and q RT-PCR carried out. Transcript level is normalised to that of actin. Values are means ± SE of triplicate reactions of three independent biological samples. Asterisks mark values that have a significant increase (p < 0.05) in mean transcription levels compared to controls without 3AT. The effect of amino acid starvation on production of sirodesmin PL could not be determined in the experiments described above. Five hours of 3AT treatment would not be long enough to affect production of sirodesmin PL as this molecule is not detected until at least four days of growth in 10% V8 juice media . Accordingly the wild type and cpcA-silenced isolate were grown for eight days on Tinline medium. Mycelia were washed and grown for a further eight days in Tinline, or Tinline with 5 mM 3AT or Tinline with no carbon or nitrogen (ie. lacking glucose and asparagine). Both isolates made low amounts of sirodesmin PL after the initial eight days of growth. After a further eight days, the amount of sirodesmin PL increased four to six fold in wild type and cpcA-silenced cultures, but there was no significant difference in the amount of sirodesmin PL, whether or not 3AT had been added to the cultures (Figure 4). However, in the absence of any carbon or nitrogen source (-C/N) there was half the amount of sirodesmin PL in wild type compared to cultures grown in the absence of 3AT (p = 0.003). In the cpcA-silenced mutant grown in the absence of any carbon or nitrogen source (-C/N) there was twice as much sirodesmin PL than in cultures grown in the presence or absence of 3AT (p = 0.05) (Figure 4). Sirodesmin PL levels in culture filtrates of in wild type (wt) and a cpcA -silenced (cpcA-sil) isolate of Leptosphaeria maculans. Cultures were grown for eight days in Tinline media (8d) and the culture filtrate isolated and sirodesmin PL levels were quantified by HPLC. Mycelia were washed then transferred to fresh Tinline medium with water (+H2O) or 5 mM 3AT (+3AT), or Tinline medium with no carbon or nitrogen sources (-C/N) for a further eight days. Culture filtrates from the three treatments (+H2O, +3AT, -C/N) were extracted and sirodesmin PL levels were quantified by HPLC. Values are means ± SE of three independent biological samples. Asterisks mark values that have a significant increase or decrease (p < 0.05) in sirodesmin PL production compared to water controls (+H2O). Production of fungal secondary metabolites is often regulated by pathway-specific transcription factors, acting through global transcription factors that control several physiological processes and respond to environmental cues such as pH, temperature, and nutrition . Given this complexity of regulation, it is not surprising that 1.5% of T-DNA insertional mutants of L. maculans analysed were sirodesmin-deficient. The finding that sirodesmin-deficiency correlated with severely reduced transcript levels of the pathway-specific transcription factor, sirZ, is consistent with studies on the regulation of production of other secondary metabolites. For instance, LaeA a master regulator of secondary metabolism in fungi such as Aspergillus spp. , regulates gliotoxin in A. fumigatus via the pathway-specific transcription factor, gliZ . Cross pathway control homologs have a complex pattern of regulation. All identified to date are transcriptionally regulated in varying degrees; levels of transcripts increase significantly during amino acid starvation (for example, S. cerevisiae Gcn4p [12, 21]. N. crassa cpc1 , A. nidulans cpcA , A. fumigatus cpcA  and F. fujikuroi cpc1 ). 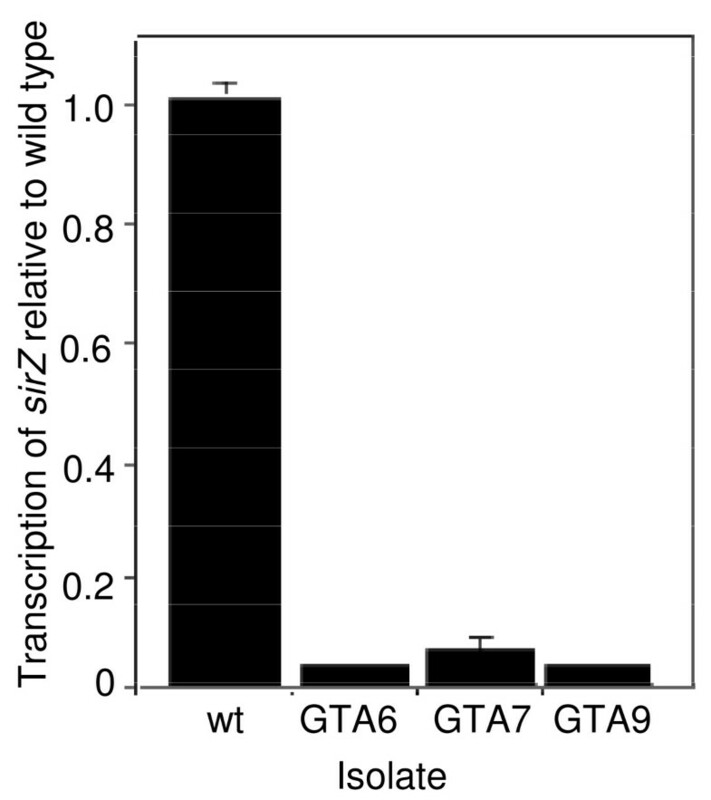 A CPRE element with one different nucleotide to that of the canonical CPRE sequence (5'-TGACTgA-3') is also present in the promoter of sirZ (-610 to -616), which suggests that CpcA may regulate sirZ directly. This element is not present in the promoter region of other genes in the sirodesmin gene cluster. Unfortunately due to the recalcitrance of L. maculans to homologous gene disruption we were unable to mutate the putative CPRE in the promoter of sirZ and test for regulation of sirodesmin PL production via CpcA. The best studied cross pathway control homolog is S. cerevisiae GCN4. Starvation for any of at least 11 of the proteinogenic amino acids results in elevated transcript levels of targets of Gcn4p. Such targets include enzymes in every amino acid biosynthetic pathway, except that of cysteine, and also in genes encoding vitamin biosynthetic enzymes, peroxisomal proteins, mitochondrial carrier proteins, and autophagy proteins [12, 21]. A comparative study of genes regulated by S. cerevisiae Gcn4p, Candida albicans CaGcn4p and N. crassa Cpc1 revealed regulation of at least 32 orthologous genes conserved amongst all three fungi . These genes mainly comprised amino acid biosynthetic genes including the tryptophan biosynthetic gene trpC [13, 14, 22, 25]. However, aroC, which encodes chorismate mutase, the enzyme at the first branch point of aromatic amino acid biosynthesis, is unresponsive to the cpc-system [14, 18]. As expected, CpcA regulated transcription of trpC in L. maculans but not of aroC in response to amino acid starvation. The cross pathway control system is also regulated at the translational level, since mutation of upstream uORFs in A. nidulans or S. cerevisiae results in increased translation of cpcA and GCN4 proteins under non-starvation conditions, compared to the wild type strains [13, 26]. In L. maculans the cpcA coding region is preceded by two upstream Open Reading Frames (ORFs), the larger one displaying sequence similarity to an uORF preceding the coding region of cpcA of A. fumigatus and A. nidulans. Thus it is likely that L. maculans cpcA is regulated translationally, as well as transcriptionally. It is puzzling why the insertion of T-DNA into the 3' UTR of cpcA in mutant GTA7 reduces production of sirodesmin PL but does not appreciably affect levels of cpcA transcript. One explanation is that the T-DNA insertion affects the regulation or increases the stability of the cpcA transcript, resulting in a cross pathway control system that is active in complete media and thus diverts amino acids from sirodesmin production. The importance of the 3' UTR in the regulation of genes is well-documented. For instance, regulatory elements in the 3' UTR control transcript stability of the global nitrogen regulator AreA in A. nidulans . Deletions in 3' UTR of this gene render the transcript insensitive to nitrogen availability. Similarly, the deletion of part of the 3' UTR of cpcA could render the L. maculans isolate insensitive to amino acid levels in the media. Given that sirodesmin PL is derived from two amino acids, tyrosine and serine, the finding that the transcription of sirodesmin biosynthetic genes, sirP and sirZ, and sirodesmin PL production appears to be regulated by cpcA and by amino acid starvation is not unexpected. It should be noted, however, that integration site effects may have contributed to these phenotypes since the site of insertion of the cpcA-silencing vector in the genome was not determined. It is unclear why the addition of 5 mM 3AT did not have as marked an effect as extreme starvation (absence of carbon and nitrogen) did on the levels of sirodesmin PL in either the wild type or cpcA-silenced isolate, when there was a marked effect on transcript levels of sirP and sirZ with addition of 3AT. This may be due to the significant difference in time periods during which the cultures were treated with 3AT; transcript levels were determined after 5 h, whilst sirodesmin PL levels were measured after eight days, after which time 3AT may have been depleted or degraded. In previous studies using 3AT to induce starvation, the effects on gene transcription were measured after 2 to 8 h [14, 23, 28]. Thus the imidazole glycerol phosphate dehydratase might have been inhibited for only a short period in the L. maculans cultures that were treated for eight days with 3AT. In the wild type culture grown in the absence of carbon and nitrogen, cross pathway control would be active during the entire eight days resulting in reduced levels of sirodesmin PL. In contrast, in the cpcA-silenced isolate grown in the absence of carbon and nitrogen, there is probably insufficient cpcA transcript to downregulate production of sirodesmin PL thereby resulting in an increased level of sirodesmin PL. Until this report such a link between CpcA and secondary metabolism had only been implicated in two filamentous fungi. In A. nidulans, biosynthesis of penicillin is regulated by CpcA . Penicillin and lysine share a common intermediate, the non-proteinogenic amino acid, α-aminoadipate. Under amino acid starvation conditions, CpcA directs metabolic flux towards lysine biosynthesis instead of penicillin biosynthesis, whilst in nutrient-rich conditions, penicillin is produced. In F. fujikoroi, cpc1 has been implicated in control of production of diterpenoid gibberellins, as deletion of glutamine synthetase leads to down regulation of gibberellin biosynthetic genes and upregulation of cpc1 . However, recent experiments have shown that Cpc1 is not responsible for down-regulation of gibberellin biosynthesis . Since cpcA regulates sirodesmin PL production, its homolog in A. fumigatus may regulate production of the related molecule, gliotoxin. An A. fumigatus cpcA mutant was attenuated for virulence in pulmonary aspergillosis of neutropenic mice, which had been immunosuppressed with cyclophosphamide and corticosteroids . However, the effect on gliotoxin production was not tested. Several research groups have shown that gliotoxin is not a virulence factor in such neutropenic mice, but is a virulence factor in mice that have retained neutrophil function after immunosuppression by corticosteroids alone (for review see ). In a study of infection of immature dendritic cells by A. fumigatus, gliotoxin biosynthesis genes were downregulated over time. However, this could not be attributed to cross pathway control because cpcA was not differentially expressed . The following model for regulation of sirodesmin PL production is consistent with all these data. When wild type L. maculans is grown on complete medium, the cross pathway control system is inactive, and amino acid biosynthesis does not occur (or occurs at a low level), but sirodesmin PL is produced. In contrast during starvation, amino acids are diverted from sirodesmin biosynthesis towards amino acid biosynthesis. This effect is mediated either directly or indirectly through the sirodesmin pathway-specific transcription factor, sirZ. Other transcription factors including LaeA and dsp3 may also regulate sirodesmin PL production either directly or indirectly through sirZ as is the case for LaeA with gliZ and gliotoxin . Production of sirodesmin PL, a secondary metabolite derived from two amino acids, is regulated in L. maculans by amino acid availability via the cross pathway control gene, cpcA, either directly or indirectly via pathway-specific transcription factor, sirZ. Production of other classes of fungal secondary metabolites that are derived from amino acids, for example, siderophores, might also be regulated via this cross-pathway control system. As more genes encoding biosynthetic enzymes for such molecules are identified, this hypothesis can be tested. Two hundred T-DNA insertional mutants generated by transforming wild type Leptosphaeria maculans isolate IBCN 18 with plasmid pGTII  were screened for ones with low levels of sirodesmin PL . Six-day-old cultures grown on 10% Campbell's V8 juice agar grown at 22°C with a 12 h/12 h light/dark cycle were overlaid with a suspension of Bacillus subtilis (NCTC 8236) in Luria Broth agar. Plates were then incubated at 37°C and the presence of zones of clearing around the fungal colony was assessed after 16 h. A sirodesmin-deficient mutant, ΔsirP, with a deletion in the peptide synthetase required for sirodesmin PL biosynthesis , was a negative control for sirodesmin PL production. Three isolates (GTA6, GTA7 and GTA9) that did not inhibit bacterial growth were characterised further. Genomic DNA was prepared from mycelia, digested with an enzyme that cuts once within the T-DNA, and then subjected to Southern analysis (data not shown). This confirmed that a single copy of T-DNA had integrated into each mutant. Thermal asymmetric interlaced (TAIL)-PCR using the primers E, CE37, CE38, CE39, CE40, CE41, CE42 (Table 2) in various combinations was performed to isolate sequences flanking the T-DNA insertions in the mutants. These flanking regions were each cloned into plasmid pCR®2.1-TOPO (Invitrogen). The sequences of the resulting plasmids were compared to the draft genome sequence of L. maculans isolate JN3 (Genoscope and Unité de Recherche Génomique Info, France) and 10 kb regions flanking these DNA fragments were analysed by FGENESH for presence of ORFs. Putative genes were BLASTed against the NCBI database to identify best matches. The site of the T-DNA insertion in relation to the nearest open reading frame was then determined. Domains in these putative genes were sought using NCBI Conserved Domain Databases, SignalP 3.0, and subcellular location of proteins was predicted using PSORT II. Transcript levels of sirZ and of cpcA, normalised to those of L. maculans actin in the wild type isolate and the three T-DNA mutants were examined. RNA was prepared using the TRIzol reagent (Invitrogen) from mycelia of the wild type (IBCN 18) and the T-DNA mutants, which had been grown on 10% V8 juice. The RNA was DNaseI-treated (Invitrogen) prior to oligo (dT)-primed reverse transcription with SuperScript III (Invitrogen). Reverse Transcription-PCR (qRT-PCR) was carried out as described  using primers sirZFA and sirZFR (for sirZ), cpcAQPCRF and cpcAQPCR (for cpcA), and act1F and act1R (for actin). The mutated gene in GTA7 had a close match to A. fumigatus cpcA, which has been well-characterised, and is henceforth named L. maculans cpcA. Untranslated regions (UTRs) 5' and 3' of the transcript and the positions of exons and introns were identified as follows. Segments of cDNA corresponding to the cpcA transcript were amplified (primers RT1, RT2, RT2A, RT3, RT4, RT5, GTA7seq4 and cpcAPROBEF) and cloned into plasmid pCR®2.1-TOPO (Invitrogen) and sequenced. Rapid amplification of 5' and 3' cDNA ends (RACE) using a GeneRacer kit (Invitrogen) was performed. Libraries were generated from cDNAs of isolates IBCN 18 and GTA7. Sequences at the 5' end of cpcA were amplified using primers GeneRacer5' and GeneRacer5'-nested and gene-specific primers 5'cpcA1 and 5'cpcA2. Sequences at the 3' end of cpcA were amplified using GeneRacer primers GeneRacer3' and GeneRacer3'-nested and gene-specific primers cpcAPROBEF and GTA7seq4. Products were cloned into pCR®2.1-TOPO and sequenced. RNA mediated silencing was exploited to develop an isolate with low cpcA transcript levels. A silencing vector was developed as described by Fox et al . and a 815 bp region was amplified from genomic DNA of isolate IBCN 18 using attB1 and attB2 tailed primers, cpcARNAiF and cpcARNAiR, respectively. This fragment was cloned into Gateway® plasmid pDONR207 using BP clonase (Invitrogen) to create plasmid pDONRcpcA. The fragment was then moved from pDONRcpcA into plasmid pHYGGS in two opposing orientations using LR Clonase (Invitrogen) to create the cpcA gene-silencing plasmid, pcpcARNAi. This plasmid was transformed into isolate IBCN 18 and two hygromycin-resistant transformants were further analysed. They both contained a single copy of plasmid pcpcARNAi at a site remote from the native cpcA locus, as determined by Southern analysis (data not shown) and the one transformant, cpcA-sil, with the greatest degree of silencing of cpcA (90%) was used in this study. To examine transcript levels, L. maculans conidia (106) of the wild type, IBCN 18, and of the silenced isolate, cpcA-sil, were inoculated into Tinline medium  (50 mL) in a petri dish (15 cm diameter) and grown in the dark, without agitation. After eight days, mycelia were filtered through sterile miracloth and washed in Tinline medium. A sample was harvested for transcript analysis. Triplicate samples of mycelia were transferred to the fresh media, which was supplemented with H2O or 5 mM of 3-aminotriazole (3AT) (Sigma), which induces amino acid starvation. After 5 h RNA was extracted from mycelia. The relative abundances of cpcA, aroC, trpC, sirZ and sirP were compared by quantitative RT-PCR using primer pairs; trpCF and trpCR (for trpC); aroCF and aroCR (for aroC), and sirPF and sirPR (for sirP), as well as primers for cpcA and sirZ as described above. In all these experiments transcript levels were normalized to those of L. maculans actin by quantitative RT-PCR using the SensiMix (dT) master mix (Quantace). Each bar on the graph represents the mean transcript level of biological triplicates with error bars representing the standard error of the mean. A student's T- test was used to determine whether differences in levels of transcripts between treatments were significant. For initial characterisation of sirodesmin PL content, the wild-type (IBCN 18), the three T-DNA mutants and the cpcA-silenced mutant were grown in still cultures of 10% V8 juice (30 ml) for six days. In experiments to determine the effect of amino acid starvation on sirodesmin PL production, triplicate cultures of the wild-type isolate and the cpcA-silenced mutant were grown in Tinline medium (30 ml). After eight days mycelia were filtered through sterile Miracloth, washed and transferred to 30 ml of fresh Tinline medium, or Tinline supplemented with 5 mM 3AT, or Tinline without any carbon or nitrogen-containing molecules. After a further eight days, mycelia were filtered through sterile Miracloth, freeze-dried and then weighed. Aliquots (5 ml) of culture filtrates were extracted twice with ethyl acetate. Production of sirodesmin PL was quantified via Reverse Phase-HPLC as described by Gardiner et al .. A student's T- test was used to determine whether differences in levels of sirodesmin PL between treatments were significant. Candace E Elliott, Ellen M Fox contributed equally to this work. We thank Dr Soledade Pedras, University of Saskatchewan, Canada for the kind gift of sirodesmin PL. We thank Dr Patrick Wincker (Genoscope, France), Dr Joelle Anselem (URGI, France), Dr Thierry Rouxel and Dr Marie-Helene Balesdent (Bioger, France), for pre-publication access to the genome sequence of Leptosphaeria maculans. We also thank the Grains Research and Development Corporation, Australia, for funds that support our research. CEE developed the T-DNA insertional mutants, carried out quantitative RT-PCR analyses and quantified sirodesmin PL. EMF screened the T-DNA insertional mutants, undertook preliminary analyses of them and generated an L. maculans isolate silenced in cpcA. RJ quantified sirodesmin PL. BJH conceived the study, and drafted the manuscript. All authors read and approved the final manuscript.